When I was in college, I had a few classmates that were from the North. Once they found biscuits and sweet tea, they were addicted. They never had anything like it. I found this pretty odd! Seeming as this is a culture norm in the south. I thought it was just the same everywhere else too. I love living in Kentucky because there are many special recipes that were created here, many originating from Great Britain and the Afro American culture. These original recipes are a real gem. While I don’t have a biscuit recipe from my ancestors (they probably used lard), I have found a really good biscuit recipe. Southerners really know how to cook ‘dem biscuits. When making biscuits, it’s really all about the technique. Learning it can take a few times to get perfect, but it’s really easy when you get it. My two hints are, make sure everything is cold and touch it the least amount that you can. If you aren’t able to find barley flour, you can just use 2 cups white flour. 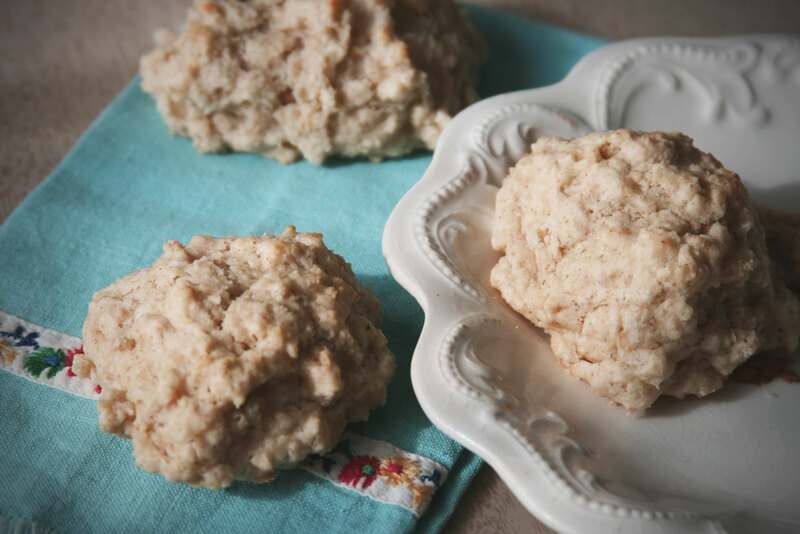 The barley flour gives the biscuits a slight nutty flavor and make the texture fluffier. I believe it’s a slightly drier flour, so I had to add a small amount of extra buttermilk. Combine your dry ingredients. I like to use my food processor, but these can be easily whisked together. Chop your cold butter into dice sized pieces. Add to flour mixture. This is also why I like to use my food processor. Pulse a few times to incorporate the butter. Or use a pastry cutter to chop into the flour. Or use your fingers to pinch the butter into the flour until it’s in a zillion tiny pieces. This of course makes the butter warm up, which reduces the amount of flakiness in the biscuit. If the butter gets too warm, refrigerate. Make a well in the center of the flour. Pour in the buttermilk. Now it gets dirty. Use your hands to fold the buttermilk into the flour. You want to incorporate the buttermilk with the least amount of movement. Too much movement means the gluten is being overworked and it will make dense biscuits. I like to use a folding motion. Use more buttermilk if the dough is too dry. You want the dough to be sticky. You can of course use a spatula, but I find that it’s easier to over work the dough with it. But I don’t blame you if you don’t want a mess on your hands. I like to make drop biscuits because rolling out the dough is another action to overwork the gluten. It’s also faster, cleaner, and looks more rustic. I make a biscuit about the size of a post-it note. I just pinch off some of the dough and put it on a prepared baking sheet. (I use a silicon mat) This recipe makes about a dozen. Heat oven to 450 degrees. Bake about 12 minutes or until tops begin to slightly brown. You can also add cheese, chives, or other goodies to add variation. Those biscuits are really good and easy to make.